Francis spoke to 50,000 of young people at an extraordinarily colorful, festive rally at the “Jose Maria Morelos y Pavon” stadium in Morelia. They had come from every one of the 32 states of Mexico for this event, and they celebrated this precious moment with him, in song, dance and personal testimonies. They had come to witness the first-ever papal visit to Morelia, the capital city of the state of Michoacán. They and Pope Francis know that in both this city and state five drug cartels have wreaked havoc on the lives of the young, and indeed of the whole society through violence, corruption, extortion, kidnapping, human-trafficking, intimidation and promises that often lead to death. Indeed, more than 100,000 have died in drug-related violence in this state in recent years and countless lives have been ruined, with many young people driven to despair. And the main market for these drugs is the United States. From his 21 years as bishop in Buenos Aires, Francis knows well the destructive force of drugs and the deadly power of the drug dealers. He supported his priests in the shantytowns in their valiant efforts to prevent young people getting involved in this deadly traffic, and he defended their leader—Father Pepe de Maria—when the drug lords threatened to kill him if he did not stop his work in those shantytowns. Today, in the stadium, he not only hit out at the drug cartels, he also sought to restore the young people by encouraging them to have a sense of their own worth and by offering them hope. In addition to all this, he said “the principal threat to hope is to allow yourself to believe that you begin to be valuable when you start wearing the right clothes, the latest brands and fashions, or when you enjoy prestige, are important because you have money; but in the depths of your heart you do not believe that you are worthy of kindness or love.” Indeed, he said, the biggest threats are “when a person feels that they must have money to buy everything, including the love of others” and when a person believes “that by having a big car you will be happy.” Francis, departing from his text debunked this way of thinking. 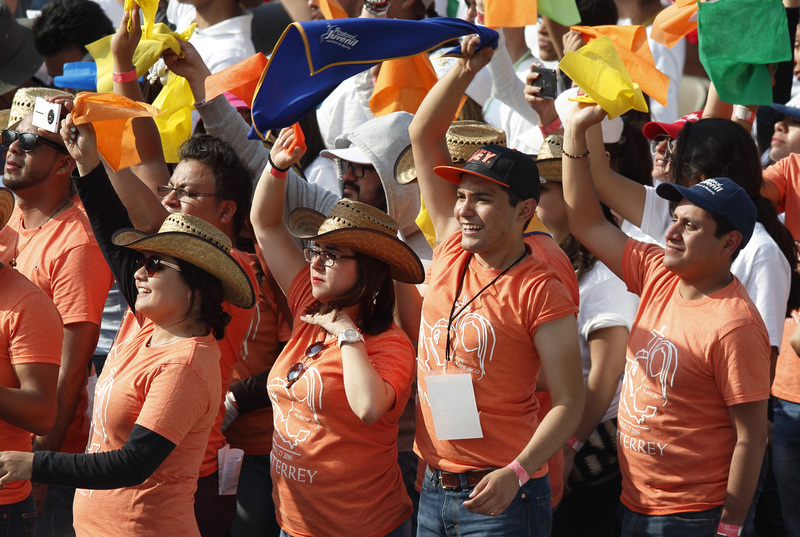 The pope’s message, however, was not just directed to the 50,000 enthusiastic youth in the stadium, it was intended for all the young people in Mexico, as Federico Lombardi, S.J., the Vatican spokesman, explained at a press briefing during the pope’s one-day visit to Morelia. Francis sees the drug trade in Mexico and the violence, corruption and human trafficking that accompany it, as not only a threat to the young people in this country, but also as a threat to the whole of society. He stated this on the first day, first when he spoke to the country’s political and civic leaders at the Palacio Nacional, and afterwards to the bishops Indeed, he called on the bishops “not to underestimate the moral and antisocial challenge which the drug trade represents for Mexican society as a whole, as well as for the church.” He wants them to be more engaged in this whole field and, today, he set an example by his visit to Morelia. Pope Francis concludes his visit to Mexico tomorrow by going to Ciudad Juarez where he is sure to address another major issue: migration.